SatNavs are essentially utilitarian and uniform. You have a GPS-linked map. You have a wee car on a pretend road in the middle of a screen. And you have chips and software working out where that wee car needs to go next. It's these extras that make the difference - the bits and bobs that give it the edge on Google Maps (which of course is very, very good). Maybe Garmin is too aware of the interchangeability of satnavs, because it hasn't included user instructions in the box (instead, you can view or download the manual through the menus when you sync the unit). You get a fat-screened tablet, an encouragingly sturdy sucker windscreen mount, an idiot's guide to plugging it in to your car's power socket and a QR Code for the complementary app - and nothing else. It's either confidence or foolishness, and only the test will show which. So let's hit the road. Plug the Nuvi in and slap it onto your windscreen, and you can take a good look at its sharp, detailed 6-inch, widescreen display in a sharp angled frame. As the screen fires up a banner descends encouraging you to "Say 'Voice Command' to search" - speech recognition is front and centre here. We'll come to that later. As well as what's in the box, you also get lifetime map updates in Europe and lifetime Digital Traffic updates - free traffic alerts that appear as notifications on the right-hand side of the screen, communicating how long a delay might be, and how many miles till the frustration begins. These take up about a third of the display. Bluetooth integration lets you sync a mobile for hands-free calls and also matches up Garmin's Smartphone Link app, adding contacts, weather at destination, contact integration and other details. Plus, there's a full FourSquare offering to find restaurants, museums and other sites of interest - which feels very 2010. Ikea seems like a generic place to start. So I ask the Nuvi, and a short exchange ensues. "Voice command." "Place." "Ikea." "Do you mean Iki?" Nope. "Back... Ikea." This went on amusingly for some time. Turns out you need to ask for "eye-key" to get your local frustrating furniture store. The Nuvi did better on street addresses, but Voice Command still only works about half the time. That's actually pretty good for this kind of thing, as anyone who's used Siri will attest, but you'll find yourself having long conversations with the Nuvi. The Bluetooth integration is another bonus, although frustratingly, the phone app wouldn't sync to the unit, even with a sturdy Bluetooth connection. Only after a thorough thumbing through the menus did I discover I had to check a box to authorise the two to communicate. which adds a superfluous level of bureaucracy to the process. It's also an issue that could have been sorted much faster if there was a manual in the box. Last Spot allows you to place a GPS pin - in a car park, for instance - then navigate your way back. And a neat touch with the app integration lets you send addresses directly to the unit from your phone's contacts, so you select "Uncle Nigel", hit send and it'll load up the route and ask to begin. But you can't send these to your favourites, which seems like an omission. Once the two devices play nicely, the Nuvi uses a combination of Garmin's Digital Traffic service sent via its DAB radio receiver and crowd-sourced info from other drivers synced to the app, popping up alerts warnings when to expect delays (in miles) and how long the wait will be. Which would be terrific, only half the time the delays never appeared - good for your journey, but it means you've been distracted for no reason. You have to learn forward and manually dismiss the alerts - which defeats the safety aspect of going hands-free while driving. Similarly, if you receive a call, you have to tap the screen to accept or dismiss. If you have a voice controlled device that links to your phone's contacts, why can't you voice-dial calls? Another disappointment is that Live Traffic costs £15.49 a year which, on top of the £200 you're paying seems a bit rum (especially as Google Maps has this information, albeit with less finesse, for free). Given that the free DAB-connected Digital Traffic service is pretty good, it's not obvious why you should pay over the odds for the Live Traffic (the smartphone version) at all. There's one final odd frustration: you can forget about adding routes to the favourite list. I simply couldn't figure out how to do it, and there is no mention of it in the manual at all. So you'll just have to settle for three, undeletable, Garmin HQ addresses and your home. 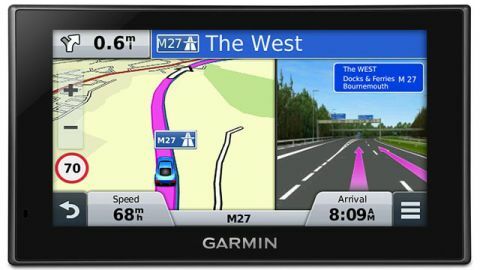 The Garmin is a sturdy, full function machine that has the premium product whiff and a raft of crowd pleasing functions. The maps are clear and concise and it got us to our destination to within a minute or two of its projected time, every time. The app connection adds value and streamlines the process. But for every great feature there's a frustration. The voice command mostly works and the Bluetooth phone integration is clear as a bell. But why can't those things be combined? Even dumb Fords offer voice dialling nowadays. Traffic alerts are handy and fulsome but often don't materialise and having to manually dismiss them is counterintuitive. But in conclusion, it's a strong system that outperforms your smartphone-and-app combos as a navigator.